1 , Our plant markers are ticker than the others so that they are harder to break. You don't need to worry about its durability. 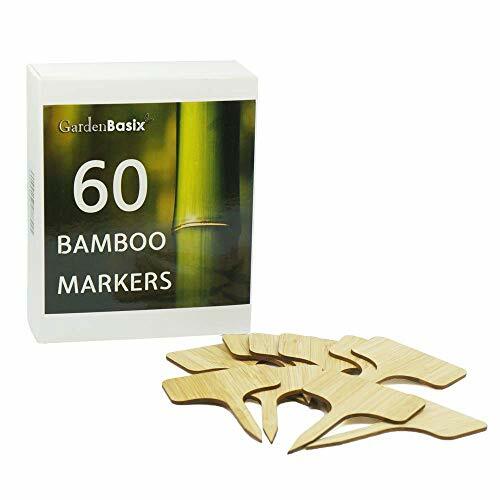 2, Our plant markers are made from 100% bamboo, using the laser engraving technology. As there are no two identical leaves in the world, every plant marker is different from the others. The markers are Eco-friendly and help to decorate your garden. 3 ,The plant markers are cut at high temperature, for this reason, the edge is brown. 4, You will receive a box with 60 exquisite plant markers in there. They are sufficient for all you needs. You can change the marker as you like. 5, On the basis of the environmental protection, you can also decorate the garden. This is a good choice for you and your family. Buy the product and Write down your experience with our products and you can share with other customers how you use them to decorate your garden or flowerpot. You will then receive one GardenBasix Set Of 15 Copper Plant Label free of charge. Just drop us a short message to our GardenBasix seller account to notify us. You will receive a box with 60 exquisite plant markers in there. They are sufficient for all you needs. You can change the marker as you like. If you have any questions about this product by GardenBasix, contact us by completing and submitting the form below. If you are looking for a specif part number, please include it with your message.